For the first time in known NFL history, a post-game press conference was held where the QB of the losing team was being interviewed right next to the the key defensive player of the opposing team. The reason Cam may have had his hood up on his now famous Panther sweatshirt may have been to try to block out the insults. 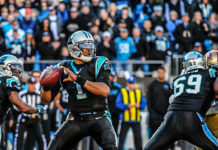 It seems clear that Cam didn’t leave because of the media – he left because he wanted to be the bigger man as the opposition continued to insult his performance.